Known for its hot springs and ice climbing park, it’s the other outdoor attractions in and around Ouray that help make it a complete year-round destination. Offers paintings, glasswork, ceramics, fiber art and more. All by local artists inspired by Colorado. Venture deep into an actual Colorado silver mine. Just outside Ouray, Colorado this guided tour is a popular family activity. Located in the restored Beaumont Hotel, Buckskin Booksellers features old and new Southwest Colorado history books, mining books, and maps. Jeep rentals designed to be easy on the pocket, with vehicles designed to handle rocky Colorado roads. Explore uniquely crafted original items from local artists designed to inspire you at this gallery of treasures. Live the history of an authentic western ranch lifestyle through exhibits, special events, rodeos, and movies at this entertaining museum. More than a museum; mountain hikes & walking tours, community involvement, mining memorabilia, lectures that bring history to life. Guided rock climbing, ice climbing, mountaineering, backcountry skiing, avalanche courses, & canyoning in Ouray Colorado, the Ouray Ice Park, and San Juan Mountains. 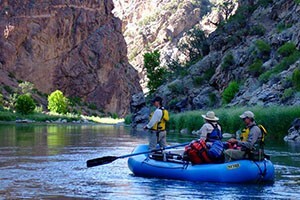 Ride-N-Rentals is Colorado's Choice for quality outdoor rentals, scenic tours and adventure. Belly up to the Outlaw restaurant for authentic, delicious western fare or head to the hills for an outdoor cookout you won't soon forget. Ouray is a great year-round desination with lots of attractions and activities in summer and winter. Located in a stunning and remote canyon, Ouray is close to great climbing, hiking, four-wheeling and fishing in summer. Winter is the perfect time to check out the ice climbing park and natural hot spring pool. Sneffels Peak is one of the most desired 14,000 foot summits in Colorado. The climb up the south side of Sneffels is strenuous and rugged, but doable if you’re an experienced hiker. The trail begins out of the Yankee Boy Basin near Ouray, and goes about three miles and 2,000 vertical feet depending on where you park. There are many other great trails like the Blue Lakes Trail off County Road 7 and the Box Canyon Falls trails off of the west side of Third Avenue in Ouray. Ouray is close to great fishing rivers, streams and lakes. The Cimarron, Gunnison and San Miguel Rivers are only short drives away, and the three Blue Lakes sit above Ouray at 11,000 feet and hold good-sized trout. The stretch of highway connecting Ouray to Silverton is known as “The Million Dollar Highway,” and it may be one of the most scenic mountain passes in the country. The wealth of avalanche slide paths means there are no guardrails separating vehicles from the road and a 1,000 foot freefall. The sheer size of the cliffs and the handful of awe-inspiring waterfalls make it tough to keep your eyes on the road despite the obvious danger. This is the ideal setting for a multi-day mountain cruise in spring or fall. Bumper stickers float around Ouray promoting it as the “Jeep Capital of the World.” Who knows if its true, but if you are an experienced driver and need a good introduction to the area’s trails, take Imogene Pass from Ouray to Telluride. It takes three to four hours and rises to an altitude of 13,200 feet. The essentail Ouray activity, the Ouray Ice Climbing Park is free of charge and consists of dozens of 80-to-200-foot waterfalls along a one-mile stretch of the Uncompahgre Gorge. The park opens in December and can stay open until March depending on the weather. 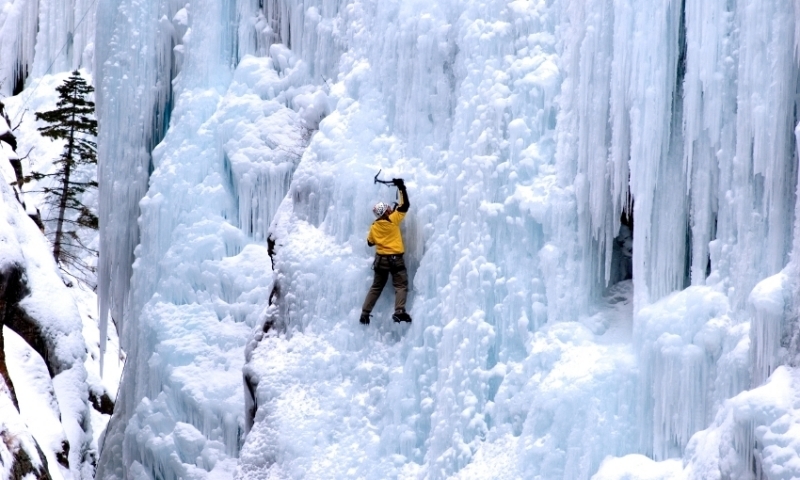 The Ouray Ice Climbing Festival is held in early January and attracts the world’s best climbers. Nearby Red Mountain Pass is a mecca for backcountry skiing and snowboarding as it seems to pull in double the snow of nearby resorts while offering all types of terrain. The pass is also some of the most avalanche prone terrain in the world, so make sure to ask locals for safe routes and updated conditions. There are Nordic skiing trails in Ironton Park south of town on Highway 550 and in the Ridgway State Park. There is no better time to visit the 250-by-150-foot Ouray Hot Springs Pool then during a cold winter evening. The soaking areas range in temperature from 96 to 106 degrees, and there’s also a lap swimming and diving area, a slide and a shallow section for children. A must-visit for any Ouray vacation. The Narrow Gauge Circle is a historical train tour that runs through the rockies. In conjunction with the US Forest Service, Ouray Trails is a group of volunteers that works to maintain Ouray's local trail systems.